1. What is a labyrinth? Labyrinths are ancient designs found in cultures around the world. The path, pictured above appears to be a maze but in actuality, it is a meditative walking path. It is a replica of the labyrinth in Chartres Cathedral installed in the 12th century. There are Cretan, Native American, Greek, Turkish, Celtic and other ancient labyrinth designs. The labyrinth is used in corporate team building applications as well as individual self discovery workshops. Unlike a maze, there is only one way in and one way out. We have a unique process of blending our Corporate Visioning and Strategy Facilitation with interspersed labyrinth walks to assist members of groups in finding their own inner wisdom, which then supports the circle of the group. 3. How is the labyrinth used? There are many ways to approach the labyrinth including an open mind meditation, walking into the labyrinth with a question, taking a walk in your group or community, using the labyrinth as a place of prayer and contemplation, focusing on new ideas and creativity or simply just walking in to relax and let go of any stresses of the day. There is no right or wrong way to walk the labyrinth. 4. What is the imagery in the labyrinth? The labyrinth is designed through systematic geometry. 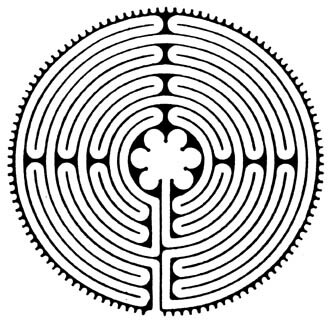 The labyrinth has circuits, or circles to the center, often an image of wholeness. There is a thirteen pointed start that is invisible in the labyrinth. There are four lunar months on a full Chartres labyrinth around the edge. The pathways meander like the flow of a river. The center is often called the rose and its petals. There is a cross through the center. 5. What themes do you use in your labyrinth programs? We have some upcoming events focused on peace walks. Other themes we use include flow, life balance, stress release, forgiveness, creativity and effective decision-making. 6. How does the labyrinth work? The labyrinth has the set the mind free by providing both a clear path and an environment of trust and liberty. The path is sure to lead you to the center, yet the turns surprise you and take you to another side of the labyrinth in just seconds. There is also something very powerful about the fact that you are walking a design that many have walked for centuries. 7. When is your next workshop? We hold an annual walk for peace on New Years Eve in King of Prussia, PA. Contact Us if you wish to be notified of this or other event. Jane Marie Downey, M. Ed., is a certified labyrinth facilitator with Veriditas. She has presented on labyrinth facilitation for the last two years at The Labyrinth Society Annual conference. Annually, she presents a week-long workshop at the RSI Asilomar conference in Monterey, CA. Jane created two canvas Chartres labyrinths in 1999. The 24 and 36 canvases were prepared by Jane and her associate and then drawn by Stuart and Mary Bartholomous. A core group who supported the labyrinth work painted the canvases. In the four years since their creation, these labyrinths have been featured at over 50 events with an estimated 2,500 walkers.